Be Sand, Not Oil. 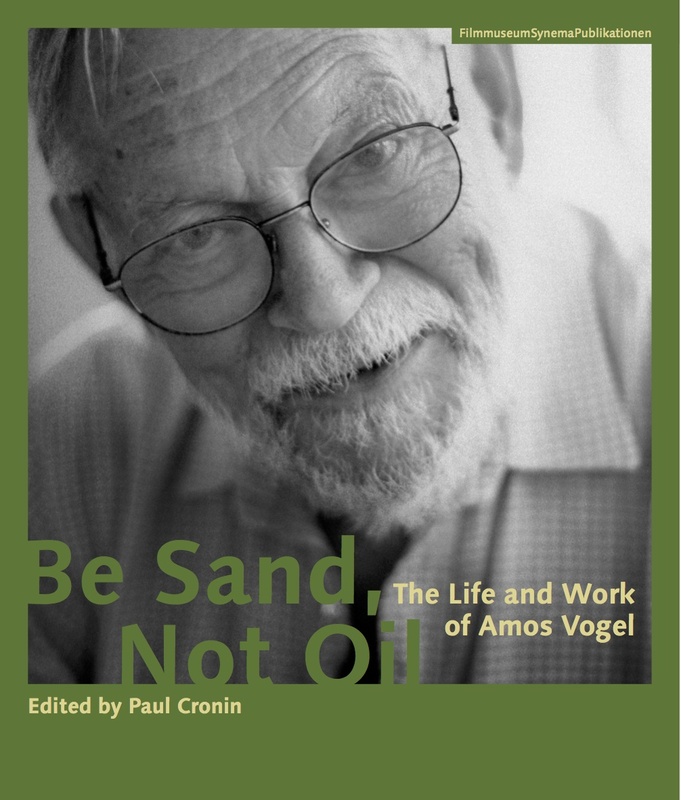 The Life and Work of Amos Vogel is the first ever book dedicated to the life and work of Vogel. What was the source of all the uncollected writings and unpublished interviews? Paul Cronin, the book’s editor, had made a film about Amos Vogel and was close to him and his family. He had direct access to the papers and, in addition, did a lot of original research on Vogel’s life and multifaceted career, as did all the other contributors to the book. It was important for us to show how much more there was to him – in terms of his writing and his film cultural activism – than his famous book from 1974, Film as a Subversive Art, and his founding of “Cinema 16” in 1947. It’s strongly significant that the Filmmuseum decides to describe the life of Vogel, who was born in Vienna but lived the most part of his life in New York. Could it represent an operation of re-appropriation? How was his bond with the hometown and with his cultural origin? I don’t know about “re-appropriation”… Amos had renewed his ties with Vienna in the early 1990s which is also when we became friends. He was our guest in 1993 for a huge project on Austrian exiles and émigrés in cinema, which was staged by the Filmmuseum, our research partners SYNEMA, and the Viennale festival. After that, he became the subject of two Austrian documentaries, I managed to have his 1974 book reprinted with a new introduction, and the Filmmuseum acquired his library of 6000 books and a part of his early, youthful writings. So for the last two decades of his life, his “dialogue” with the city of his youth had been re-established. He was also interested in Austrian cinema and wrote the first essay on Haneke in Film Comment, for instance. And he very much shared our own view of cinema. Some books released by Filmmuseum are monographs dedicated to single intellectuals. Be Sand, Not Oil is one of those. Who are these artists? Which is your editorial line in choosing them? Our books are usually related to one of our larger curatorial projects or research topics. Sometimes, the connection is to an important retrospective or presentation project (e,g. Claire Denis, Apichatpong Weerasethakul, Jean Epstein, Romuald Karmakar, Joe Dante, Olivier Assayas, Guy Debord, Hou Hsiao-hsien…). In other cases, the books connect with important aspects of our collection (e.g. the Dziga Vertov Collection, Peter Tscherkassky, Josef von Sternberg and Vienna, Peter Kubeka’s cycle Was ist Film, James Benning, Amos Vogel, the upcoming book on amateur film…). And thirdly, there are cases – like the books Film Curatorship, Screen Dynamics and our three volumes on the occasion of the Filmmuseum’s 50th anniversary last year – where we try to reflect on our discipline or métier as such. The editorial line is not very rigid, but we are definitely trying to see our different activities as inter-connected. One criterion for decisions about a book is, of course, if we think the subject is important but hasn’t yet been covered widely elsewhere. In other words: we won’t do a general Hitchcock book anytime soon. What about your future releases? This fall, we will publish a rich collection about the Archaeology of Amateur Film, to be followed by the first English translation – including some new material – of Alain Bergalas’s influential book about film education, L’hypothèse cinéma, as well as books about the German filmmaker Werner Schroeter and avant-garde icon Robert Beavers. A book about U.S. cinema of the 1980s is also in the works.